Who doesn’t love PIZZA? 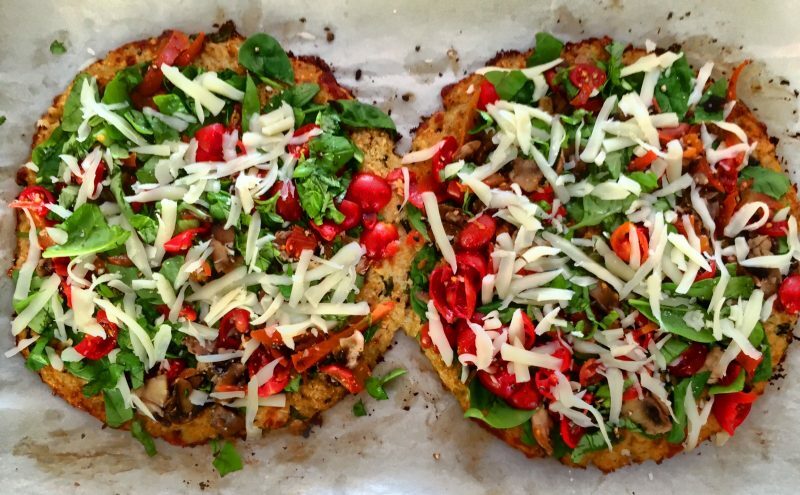 This recipe has a great balance of flavors, making it hard to believe that the crust is made with cauliflower, and an entire personal-sized pizza is only 350 calories. Preheat oven to 375 degrees. In a food processor, pulse half of cauliflower 10 to 15 times or until finely chopped (like rice). Transfer to a parchment-lined baking sheet. Repeat with remaining cauliflower. Coat cauliflower with cooking spray. Bake, stirring once, for 25 minutes. Let cool. Increase oven temperature to 450 degrees. Warm a large skillet over medium-high heat. Add 1 tsp. oil; swirl to coat. Add mushrooms and bell pepper; sauté until tender, about 5 minutes. Place cauliflower in a clean kitchen towel and squeeze until very dry. 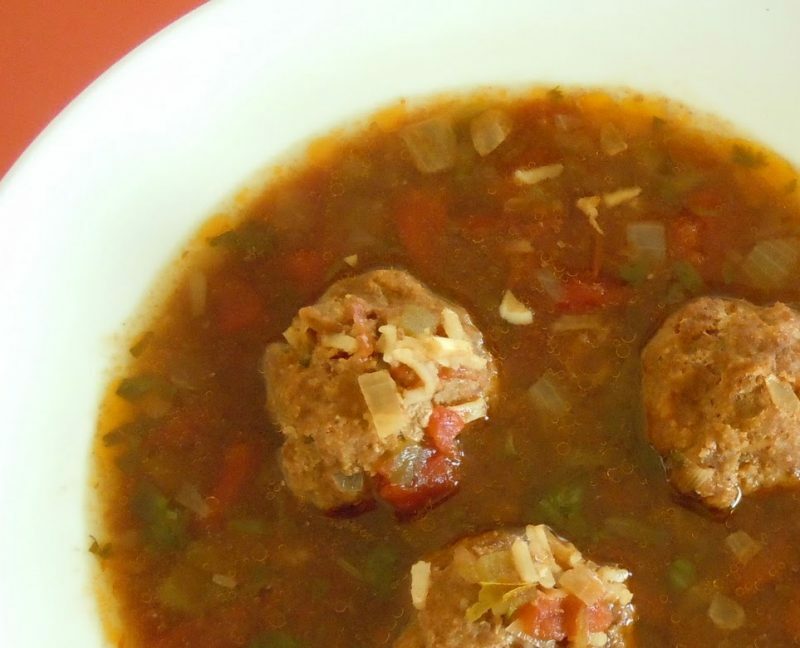 In a large boawl, combine cauliflower, remaining 1 tsp. oil, 1/4 cup basil, 1/8 tsp. black pepper, salt, garlic, 2 oz. mozzarella, egg whites and Parmesan. On a parchment-lined baking sheet, press mixture into two 8-inch circles. Coat crusts with cooking spray. Bake crusts until browned, about 20 minutes. 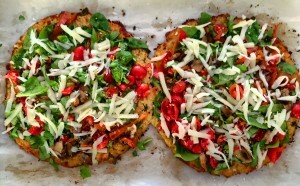 Remove from oven; top evenly with mushroom mixture, tomatoes, spinach, remaining 1/4 cup basil, remaining 1/8 tsp. black pepper and remaining mozzarella. Bake until cheese melts, about 7 minutes. Trimm-Way has some new recipes which take only about 20 minutes with 300 calories or less per serving. First of all, who likes Pizza? Preheat oven to 475 degrees. 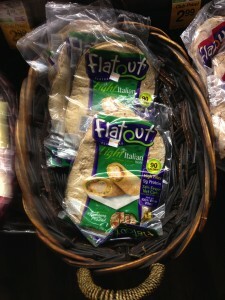 Place Flatout Flatbread on a cookie sheet and spread ingredients evenly. Bake for 10 minutes, or 12 minutes for crispier crust.